High Five Bilingüe is a magazine for young children — in Spanish and English — based on the same character- and skill-building fun that has made High Five magazine a favorite. It’s English AND Spanish Learning for kids! 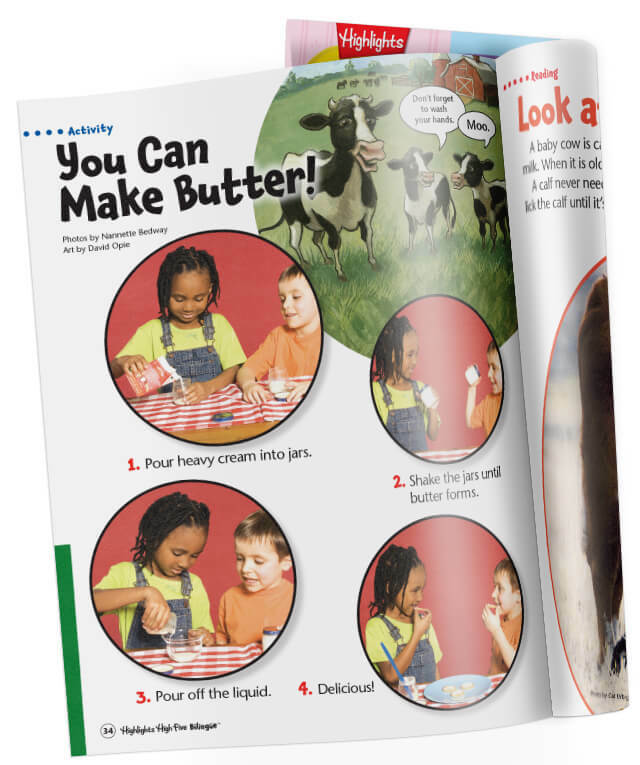 Each monthly issue brings 36 pages of read-along stories, poems, puzzles and crafts — in both languages — that set young children on the path toward lifelong learning and language proficiency. With content appropriate for beginning readers, as well as for children and adults just learning Spanish or English, High Five Bilingüe engages little ones and makes them excited to learn and practice vocabulary. Every issue has 14 pages of stories, puzzles and activities entirely in Spanish, which are then repeated in English, plus several pages in both languages together. Colorful illustrations help kids understand the words and ideas in each piece. Just like with High Five magazine, children will look forward to reading new adventures of familiar characters every month, gain confidence from solving age-appropriate puzzles, and laugh along with fun stories and poems. Get a FREE gift with your High Five Bilingüe subscription!